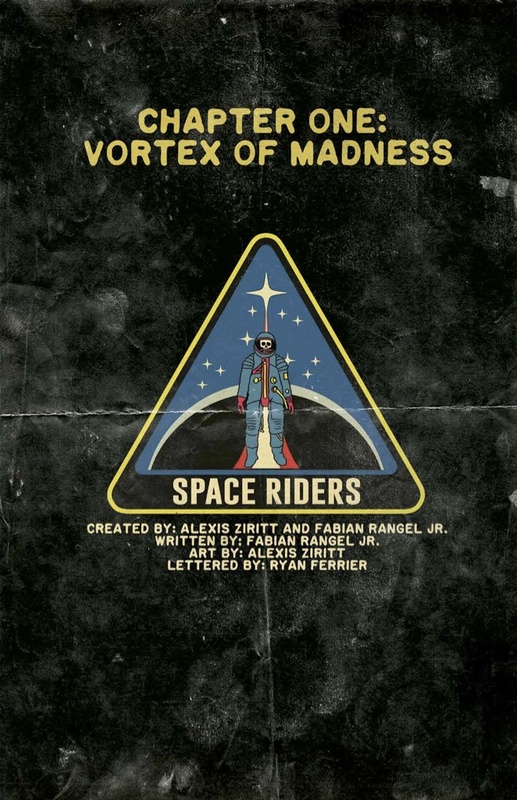 Posted on March 30, 2015 by thelostlighthouse	in Comics, Literature and tagged Alexis Ziritt, Black Mask Studios, comics, comics reviews, Fabian Rangel Jr., Heavy Metal, Literature, psychedelic, Sci-Fi, Space Riders, The Lost Lighthouse, TLL. Adam reads as many comics as he can afford. Every week he attempts a review of one of them, with potential minor spoilers. Space Riders stars Capitan (not Captain) Peligro, a gruff ship leader betrayed by his first mate, a fellow Space Rider, in the middle of a war. Following psychological evaluation, Peligro is relieved of his command for one year, which he seems to largely spend in a dive bar. He is finally brought back to active duty by his new first mate Mono (who is a baboon man) and Yara, the android who pronounced him unfit for active duty before. They return him to his ship, the skullship Santa Muerte (literally a spaceship in the shape of a skull) and they head out of orbit. They’re attacked by space pirates, and during their escape via interstellar jump they get trapped in ‘The Red Cloud’, a singularity-like vortex that sends them all temporarily mad, damaging the ship in the process. With the navigation out of action, they are sent plummeting towards the nearest planetoid. This is a loud, brash comic that bleeds nostalgia, and works very well because of it. Peligro is a caricature, but a fun one, and the slightly ridiculous cast of supporting characters, most of whom are anthropomorphised, fill out the rest of the universe. It reminded me a lot of God Hates Astronauts, and I spent most of the read not really understanding what was happening, but not at all caring. Aesthetically the book is a psychedelic homage to Heavy Metal, with bold and intense colours and explosions. The almost kaleidoscopic splash page of the Santa Muerte spinning through the Red Cloud is particularly impressively from Ziritt. Space Riders is a fun, over the top comic. I have no idea where the story will go, but it should be funny finding out. Issue #1 is out this Wednesday (1st April 2015), so check it out at your local comic book shop or try it out digitally.